Yara Shalaby is the only female rally driver in Egypt — and in just a few years of racing she’s racked up impressive results, including first in the amateur category at the 2015 Motorplex Solo Race UAE. As Yara Shalaby races through the desert toward a sand dune, the risks are high: She could flip her truck if she takes a wrong angle, get stuck if she accelerates too lightly, or crash if she speeds over the top too quickly. Sometimes, though, surmounting the dunes is the least of her challenges: Shalaby is Egypt’s only female desert-racing driver. When she took up the sport five years ago, she had to convince some of the male drivers that she was smart enough and strong enough to join their training safaris. 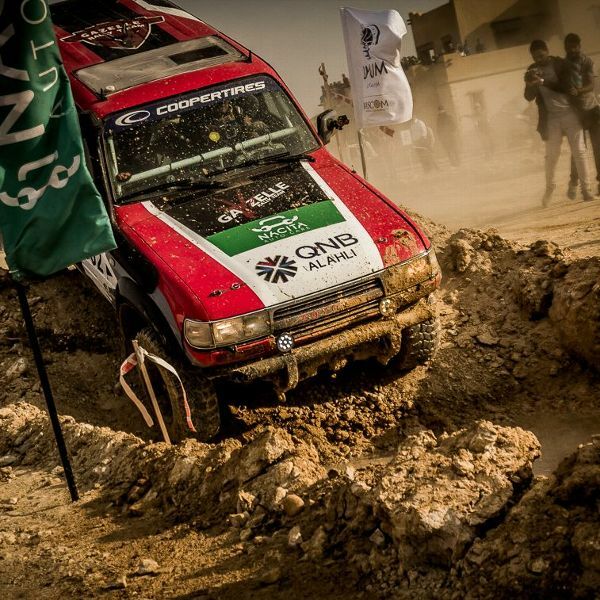 In 2015, just when she was posting impressive finishes in races in Egypt, including a first for her country in the prestigious 1,800-mile Pharaons Rally, the government banned races in the desert, trying to stamp out a growing terrorist threat. And when she turned instead to the deserts of the United Arab Emirates, nearly 2,000 miles from her home in Cairo, it began a two-year quest to enter the Abu Dhabi Desert Challenge this March. The race is part of a World Cup for cross-country rallies, and drivers who have seen Shalaby in action have no doubt she can compete with the best in the sport. Rally drivers navigate off-road from point to point during a race — using only a road map. Unlike other motorsports where drivers loop a set track for a set number of laps, rally drivers and copilots navigate off-road from point to point using a road book and their wits. In some rallies they ride for 10 hours a day, for multiple days, in rebuilt four-wheelers with roll cages and fire extinguishers, camping overnight in the wilderness with their support teams. There are three groups of drivers in these races, says Mido Abouyoussef, a Pharaons organizer who has competed in rallies around the world. Those struggling to finish, those able to finish but far from the lead, and those with a shot at winning, he says. That last group holds teams run by auto manufacturers, and some amateurs like Shalaby. “She has the talent to be in that top group,” Abouyoussef says. Shalaby, 36, is an IT specialist at a bank, the single mother of an 8-year-old boy and an adventure junkie. She was already parachuting, parasailing and mountain climbing when she got hooked on desert driving in 2012 during a safari in the Sahara with coworkers. She was amazed at how the vehicles tore through deep drifts of sand, zoomed up and over tall dunes and streaked across rocky flats — and how the drivers commanded the terrain with so much skill. Within a few months, she entered a rally in Egypt’s Eastern Desert and finished 10th out of 11 cars. By the end of 2013, she moved up to fourth out of 12 cars in a rally in the Western Desert. Although a predecessor, Samia Allouba, was a copilot and co-driver with her husband in the Pharaons Rally in the early 1990s, Shalaby was the first Egyptian woman driver to finish the cross-country race. Typically spanning five days and covering about 370 miles a day, the race was started by a French racer in 1982 and suspended the past two years. Shalaby finished first in the national category in 2014, though there were only two Egyptian drivers, and 14th overall out of about 35, including one other woman. Abouyoussef, the race organizer, remembers how Shalaby had to spend the night in the desert after car trouble set her back and left her inching around the dunes in the dark. She and her copilot were back on course at daybreak and, after some quick refueling and repairs, on the starting line in time for the third stage. After the Pharaons race, Shalaby was selected by the sport’s governing body, the International Automobile Federation, or FIA, with eight other female racers from around the world for a training course in Qatar in 2015. It was aimed at increasing the ranks of women in the sport, which crowned Michèle Mouton and co-driver Fabrizia Pons as the first women to win a world championship rally in Italy in 1981. When Shalaby first started racing, she would occasionally hear sexist comments from opponents that she’d never be able to survive the course or that she had no business off-roading because women can’t even drive on paved roads. “Once I proved myself, the total opposite started to happen — complete support and cheering from the same exact individuals who used to mock me,” she says. The FIA course fit right into her plan to form the Middle East’s first all-female rally team. Several women were interested in training to be copilots and mechanics with Shalaby, but they couldn’t dedicate enough time or their enthusiasm died, she says. And learning during races backfired, as two of her copilots got them lost in the desert. “I failed miserably,” she says. The better approach, she says, would be establishing a school for women rally racers, a dream she has for the future. Yara Shalaby has always been an adventure junkie. The single mom also loves parachuting, parasailing and mountain climbing. In the meantime, she is making progress, slowly, toward the Abu Dhabi world cup race. Her first step was getting her Land Cruiser to the U.A.E. in the fall; that was the cheapest way to race in the Gulf, she figured. But the yearlong ordeal included being turned down for permission to drive through Saudi Arabia; shipping her car to a garage in Dubai that had no experience with FIA regulations; and finding a new garage with rally experts, who soon discovered that she would need an entirely new roll cage to comply with new FIA rules. It would be cheaper to buy a used rally car in the U.A.E., she realized, than to rebuild her 1997 Land Cruiser. The next step was getting a copilot. Ian Greasby, an oil industry worker from England who moved to Egypt two years ago, was impressed with Shalaby’s ambition and wanted to see if it matched her talent. She wanted someone with experience, and Greasby had run the 1,500-mile Abu Dhabi course a dozen times, racing a motorcycle and driving a sweep truck that collects broken-down bikes. They entered her Land Cruiser in a non-FIA, closed-circuit race in Dubai in early December. He was impressed with her gear selection and strategy around the 12-mile loop and up and over the dunes. She came in second of five cars in her category. Even with Greasby paying his own way, Shalaby needs to raise about $55,000 to field an eight-person team for Abu Dhabi. About half would go toward a used four-wheeler and the rest for everything from hiring local mechanics to feeding her crew for the week. In late December, she secured about a quarter of the cost with a sponsorship by an auto paint company. By the end of this month, she was hoping to have another sponsor or two on board and her Land Cruiser sold. “It’s all about money,” Shalaby says. And every bit of the hassle is worth it.